Active human visceral leishmaniasis (VL) is characterized by a progressive increase in visceral parasite burden, cachexia, massive splenomegaly, and hypergammaglobulinemia. In contrast, mice infected with Leishmania donovani, the most commonly studied model of VL, do not develop overt, progressive disease. Furthermore, mice control Leishmania infection through the generation of NO, an effector mechanism that does not have a clear role in human macrophage antimicrobial function. Remarkably, infection of the Syrian hamster (Mesocricetus auratus) with L. donovani reproduced the clinicopathological features of human VL, and investigation into the mechanisms of disease in the hamster revealed striking differences from the murine model. Uncontrolled parasite replication in the hamster liver, spleen, and bone marrow occurred despite a strong Th1-like cytokine (IL-2, IFN-γ, and TNF/lymphotoxin) response in these organs, suggesting impairment of macrophage effector function. Indeed, throughout the course of infection, inducible NO synthase (iNOS, NOS2) mRNA or enzyme activity in liver or spleen tissue was not detected. In contrast, NOS2 mRNA and enzyme activity was readily detected in the spleens of infected mice. The impaired hamster NOS2 expression could not be explained by an absence of the NOS2 gene, overproduction of IL-4, defective TNF/lymphotoxin production (a potent second signal for NOS2 induction), or early dominant production of the deactivating cytokines IL-10 and TGF-β. Thus, although a Th1-like cytokine response was prominent, the major antileishmanial effector mechanism that is responsible for control of infection in mice was absent throughout the course of progressive VL in the hamster. Visceral leishmaniasis (VL),3 caused by the intracellular protozoan Leishmania donovani, is a progressive, potentially fatal infection characterized by chronic fever, hepatosplenomegaly, pancytopenia, and profound cachexia. Active disease is associated with an ineffective parasite-specific cell-mediated immune response (1, 2). However, in endemic areas, a significant number of individuals acquire subclinical infection that is associated with the development of Ag-specific T cell responses and IFN-γ production and resistance to visceral infection (3). Mice infected with L. donovani have been widely studied, but this model does not reproduce the features of active human VL. In this animal, there is an early increase in parasite burden, but over the course of 4–8 wk the infected mouse is able to mount an antileishmanial cellular immune response and control the infection. This control is mediated by IFN-γ production by splenic T cells (4, 5), which are driven toward a Th1 phenotype by IL-12 (6). The generation of NO, through the up-regulation of inducible NO synthase (iNOS, NOS2) by IFN-γ, is the critical macrophage effector mechanism involved in the control of parasite replication in the mouse (7, 8). Thus, the murine model of L. donovani infection is a good model of early parasite replication followed by immunological control and subclinical infection, but there is no murine model for the progressive disease observed in human active VL. In contrast, the clinicopathological features of the hamster model of VL closely mimic active human disease. Systemic infection of the hamster with L. donovani results in a relentless increase in visceral parasite burden, progressive cachexia, hepatosplenomegaly, pancytopenia, hypergammaglobulinemia, and ultimately death (9, 10). Unfortunately, studies in the hamster model are limited by the lack of available immunological reagents. We cloned several hamster cytokine cDNAs to dissect the mechanisms related to progressive disease in this model (11). In this report we show that despite strong expression of the Th1-like cytokines in the liver, spleen, and bone marrow, there is uncontrolled parasite replication at these sites, leading to progressive disease. In the face of this strong IFN-γ expression, there was no detectable NOS2 mRNA expression or tissue enzyme activity, which is strikingly different from what was found in infected mice. Increased IL-4 expression was not observed in either the liver or spleen, but later in the course of infection there was substantial production of the active form of TGF-β and IL-10, cytokines that are known to suppress macrophage activation and generation of NO (12, 13). These data indicate that progressive disease in this model is associated with a defect in the generation of NO, an effector mechanism that is critical to the control of infection in the murine model. Six- to 8-wk-old outbred Syrian golden hamsters (Mesocricetus auratus) and 6-wk-old BALB/c mice were obtained from Charles River Breeding Laboratories (Wilmington, MA) and maintained in a specific pathogen-free facility. Animals were handled according to local and federal regulations, and research protocols were approved by our Institutional Animal Care and Use Committee. L. donovani (MHOM/SD/001S-2D) promastigotes were cultured in M199 medium supplemented with 15% heat-inactivated FCS (HIFCS), 0.1 mM adenine, 5 μg/ml hemin, 1 μg/ml biotin, 2 mM l-glutamine, 100 U/ml penicillin, and 100 μg/ml streptomycin (14). Metacyclic promatigotes were obtained from cultured stationary phase promastigotes (recently transformed from hamster-derived amastogotes), according to the method first described by Sacks (reviewed in Ref. 14). Briefly, 5- to 6-day-old stationary cultures were washed and then resuspended in DMEM at 2 × 108/ml. The parasites were incubated with peanut agglutinin (50 μg/ml) for 15 min at room temperature, and the agglutinated parasites were pelleted by centrifugation at 200 × g. The metacyclic promastigotes were then collected from the supernatant, washed, and used immediately for the animal infections. Hamsters were infected by intracardial inoculation of 1 × 106 purified metacyclic promastigotes. At 3, 10, 28, and 56 days postinfection (p.i.) the animals were weighed and blood was collected. The animals were then euthanized, and the liver, spleen, and bone marrow were harvested for determination of parasite burden, cytokine analysis, or cell culture. Mice were infected by i.v. (lateral tail vein) inoculation of 1 × 106 purified metacyclic promastigotes, and the mice were euthanized and tissue harvested at days 28 and 56 p.i. Bone marrow from hamsters was isolated as follows: both femurs were isolated free of surrounding tissue and immediately cut with scissors at each end to expose the marrow cavity. A 23-gauge needle was inserted into the cavity, and the marrow was obtained by flushing with 1.0 ml of ice-cold DMEM containing 2% FCS. The cell suspension was used for determination of parasite burden, or the cells were pelleted by centrifugation at 1000 × g for 5 min at 4°C and the cell pellet frozen in liquid nitrogen. The parasite burden was quantified in spleen, liver, and bone marrow tissue by limiting dilution culture as we have previously described (15). The spleen and liver were harvested, and the total weight was determined. In the case of the bone marrow, the total marrow flushed from two femurs was teased to a single-cell suspension in 2 ml of medium. A weighed piece of spleen or liver (20–40 mg) was homogenized between the frosted ends of two sterile glass slides in 1 ml of complete M199 culture medium and diluted with the same medium to a final concentration of 1 mg/ml. Next, 100 μl of bone marrow suspension (one-tenth of the marrow from one femur) was similarly homogenized. Fourfold serial dilutions of the homogenized tissue suspensions were then plated in a 96-well tissue culture plate and cultured at 26°C for 2 wk. The wells were examined for viable (motile) promastigotes at 3-day intervals, and the reciprocal of the highest dilution that was positive for parasites was considered to be the concentration of parasites per milligram tissue (liver and spleen) or per one-tenth of total bone marrow. The total organ burden was calculated using the weight of the liver and spleen or a correction factor of 10 for the bone marrow. The cDNA probes used for northern blotting were those we had previously cloned from hamster spleen cells (11). GenBank accession numbers for the hamster cytokine and hypoxanthine phosphoribosyltransferase (HPRT) cDNAs used in this study are as follows: IFN-γ (AF034482), IL-2 (AF046212), IL-4 (AF046213), IL-10 (AF046210), IL-12p40 (AF046211), TNF-α (AF046215), TGF-β (AF046214), and HPRT (AF047041). The mouse NOS2 cDNA probe (1.8 kb) was purchased from Cayman Chemical (Ann Arbor, MI). A 199-bp DNA probe for hamster NOS2 was obtained by PCR amplification of genomic DNA that was isolated from hamster spleen tissue using the QiAmp Tissue kit (Qiagen, Chatsworth, CA). The iNOS forward (5′-GCAGAATGTGACCATCATGG) and reverse (5′-CTCKAYCTGRTAGTAGTAGAA) primers targeted sequences found in exon 12 of the human macrophage iNOS sequence (16), which had a high level of identity to the corresponding mouse and rat sequences. In these sequences, degenerate bases are indicated by the appropriate International Union of Pure and Applied Chemistry single-letter designation (K = G or T, Y = C or T, R = A or G). The amplified product was then cloned into pCR2.1TOPO (Invitrogen, San Diego, CA), and the identity of the cDNA was confirmed by sequence homology to published NOS2 cDNA sequences. Each of the cytokine, NOS2, and HPRT cDNA probes was isolated by digestion of the plasmid with EcoRI followed by separation by agarose electrophoresis and extraction from the gel. The in situ splenic, hepatic, and bone marrow cytokine and iNOS expression in uninfected and L. donovani-infected hamsters was analyzed by Northern blotting. Total RNA was extracted from the frozen tissue using acid guanidinium isothiocyanate-phenol-chloroform (17), and Northern blotting was performed as previously described (18). RNA (30 μg) was separated on formaldehyde-agarose gels, electroblotted onto a nitrocellulose membrane, and cross-linked by UV light. The blot was prehybridized in standard buffer, and the blots were then hybridized at 42°C for 16 h with [α-32P]dCTP-labeled cDNA probe (6 × 105 cpm/ml). The blots were washed and then exposed at −80°C to Kodak XAR-5 film with Kodak intensifying screens (Rochester, NY). Hybridization with the HPRT probe was used to assess loading equivalency and RNA integrity. To quantify the intensity of autoradiographic signals obtained by Northern blot, we employed a desktop digital imaging method with an optical scanner (19). Briefly, the autoradiograms were scanned by standard video imaging equipment connected to a Power Macintosh computer (Apple Computer, Cupertino, CA), and the image was analyzed using an NIH Image 1.59 analysis software package with an integrated density program. The area analyzed for each band was kept constant for all the bands in an autoradiogram. Background density on the autoradiogram was subtracted from the densitometric data of each band. The results were expressed as a ratio of specific gene to that of corresponding HPRT expression to normalize to the quantity of RNA loaded. TNF/LT production by liver and spleen tissue and isolated spleen cells was determined using a bioassay and specific neutralization with an anti-TNF-α polyclonal Ab. A single-cell suspension of hamster spleen cells from infected and uninfected animals was obtained by disruption of the organ between the frosted ends of two sterile glass microscope slides. The RBC were lysed in 0.83% ammonium chloride in 0.01 M Tris-HCl, and the remaining cells were washed in DMEM. The spleen cells were cultured in DMEM with 10% HIFCS (HyClone, Logan, UT), 50 μg/ml gentamicin, 1 mM glutamine, and 25 mM HEPES at 106 cells/ml in a 5% CO2 atmosphere at 37°C. After 24 h of culture, the supernatants were harvested and frozen at −70°C until analysis. The liver and spleen tissue homogenates were obtained by homogenization of a piece of freshly isolated tissue at a concentration of 50 mg/ml in DMEM + 2% HIFCS using a tissue homogenizer (TissueMite; Tekmar, Cincinnati, OH). The samples were centrifuged at 10,000 × g for 10 min, and the supernatant was collected and frozen at −70°C until analysis. The TNF/LT concentration in the cell supernatants and tissue homogenates was determined by assay for cytotoxic activity against the mouse fibroblast L929 cell line. This bioassay will detect both TNF and LT activity, and the rabbit anti-mouse TNF-α polyclonal Ab (1:100 dilution; Genzyme, Cambridge, MA) is likely to neutralize both TNF and LT. L929 cells were seeded at 2 × 104 cells per well in 100 μl of DMEM with 10% HIFCS and cultured for 18 h at 37°C in a 5% CO2 atmosphere. The culture medium was then removed from the monolayer, and 100 μl of fresh medium containing 2 μg/ml actinomycin D and 100 μl of the sample to be tested were added to the wells. The negative and positive (maximum lysis) controls consisted of medium alone and medium containing 0.1% saponin, respectively. Each sample was tested in triplicate. A standard curve was constructed with dilutions of recombinant mouse TNF-α. The cells were then incubated for 24 h at 37°C, after which 20 μl of MTT (5 mg/ml in PBS) was added and the cultures incubated for an additional 4 h. The medium was then removed and the dye extracted with isopropyl alcohol/HCl, and the OD was read at 600 nm. The concentration of TNF/LT in the experimental samples was determined by interpolation from the standard curve. In selected experiments, the specificity of the assay for TNF/LT was confirmed by blocking with the neutralizing Ab that cross-reacts with hamster TNF/LT (20). The level of expression of the active form of TGF-β in spleen, liver, and bone marrow homogenates was determined by Western blotting. Equal amounts of homogenates (equivalent to 60 mg of tissue) from control and infected spleen tissue were subjected to 16.5% SDS-PAGE under nonreducing conditions and electroblotted onto nitrocellulose membranes (Schleicher & Schuell, Keene, NH) (21). The membranes were incubated with 10% normal goat serum (preimmune) to block for nonspecificity followed by incubation at 23°C for 1 h and 4°C for 18 h with affinity-purified chicken anti-human TGF-β1 polyclonal Ab (R&D Systems, Minneapolis, MN) at a concentration of 6 μg/ml (optimal concentration of Ab was determined in a separate experiment). The membranes were washed with a buffer containing 20 mM Tris (pH 7.5), 500 mM NaCl, and 0.05% Tween 20 and then incubated sequentially with sheep anti-chicken Igs for 2 h at 23°C and 125I-protein A (0.33 μCi/ml; Amersham, Arlington Heights, IL) for 2 h at 23°C. Autoradiography and densitometry of autoradiogram was conducted as described earlier. Recombinant human TGF-β1 was used as a standard (R&D Systems). The level of Leishmania-specific IgG in the sera of uninfected and infected hamsters was determined by ELISA. Nunc Maxisorp microtiter plates (Naperville, IN) were coated with 50 μg/ml soluble L. donovani Ag (22) in 100 μl of carbonate buffer per well overnight at 4°C. The wells were blocked with 3% BSA and then incubated with 50 ml of a 2-fold dilution of serum for 1 h at 37°C. The wells were washed with TBS containing 0.5% Tween 20 and then incubated with a peroxidase-conjugated goat anti-hamster IgG. After a 1-h incubation at 37°C, the wells were washed, the o-phenylenediamine chromagen was added, and the plates were read by an automated plate reader at 490 nm. Serum dilutions from infected hamster were considered positive if the mean of duplicate wells was >3 SDs above the mean of the age-matched uninfected controls. The Ig isotypes were quantified in sera from infected and uninfected hamsters by radial gel diffusion using rabbit anti-Syrian hamster IgM, IgG1, IgG2, IgG3, and IgA as previously described (23, 24). Purified hamster Igs were used as standards. Inducible NOS (Ca2+-independent NOS2) and cNOS (Ca2+-dependent NOS) enzymatic activities were determined in infected and uninfected mouse and hamster spleen tissue homogenates (10 μg protein) by the extent of conversion of l-[3H]arginine to l-[3H]citrulline in the presence (iNOS) or absence (cNOS) of Ca2+ chelators using the NOSdetect assay kit (Stratagene, La Jolla, CA) as described previously (25). Hamsters were infected intracardially with 1 × 106 metacyclic promastigotes, and the evolution of disease was studied at days 3, 10, 28, and 56 p.i. With this inoculum, the parasite burden increased progressively in the spleen (>6-log increase) and liver (∼4-log increase) over this time period. The parasite burden in the bone marrow increased ∼5 logs between days 10 and 28 p.i., but then decreased by day 56 p.i. (Fig. 1⇓A). By day 56 p.i., the infected hamster bone marrow had a decreased cellular mass, and the peripheral blood hematocrit had decreased by an average of 18% (data not shown), indicative of bone marrow dysfunction and/or destruction. Infected hamsters gained weight at a rate similar to uninfected controls until day 28 p.i. By day 56 p.i., the infected hamsters had lost 18% of their body weight and weighed at least 50 g less than the age-matched controls (Fig. 1⇓B). Muscle wasting was clinically evident by day 56 p.i. Infected hamsters began to develop splenomegaly after day 10 p.i., and by day 56 p.i. the spleen weight had increased ∼7-fold over that of the age-matched controls (Fig. 1⇓B). There was no difference in liver weights between uninfected and infected animals at any time point (data not shown). Clinical and parasitological features of VL in the hamster. A, Evolution of the parasite burden. The parasite burden in the liver, spleen, and bone marrow of hamsters infected with 106 metacyclic L. donovani promastigotes was determined on days 3, 10, 28, and 56 p.i. by limiting dilution quantitative culture. The reciprocal of the highest dilution that was positive for parasite growth was considered to be the concentration of parasites per milligram of tissue (liver and spleen) or per one-tenth of total bone marrow. The total organ burden was calculated using the weight of the liver and spleen or a correction factor of 10 for the bone marrow. Results are expressed as the log of the total organ parasite burden (mean of five samples with SE bars). B, Changes in the body and spleen weights over the course of infection with L. donovani. The mean body weight (g) and spleen weight (mg) of five uninfected or infected animals is shown with SE bars. By day 56 p.i., the infected animals were noticeably cachectic. The level of Leishmania-specific IgG increased dramatically from day 10 through 56 p.i. By day 56 p.i., specific antileishmanial Ab could be detected at a serum dilution of >1:70,000 (Fig. 2⇓, inset). The quantity of IgM, IgA, and each of the IgG subclasses was determined by immunodiffusion (Fig. 2⇓). 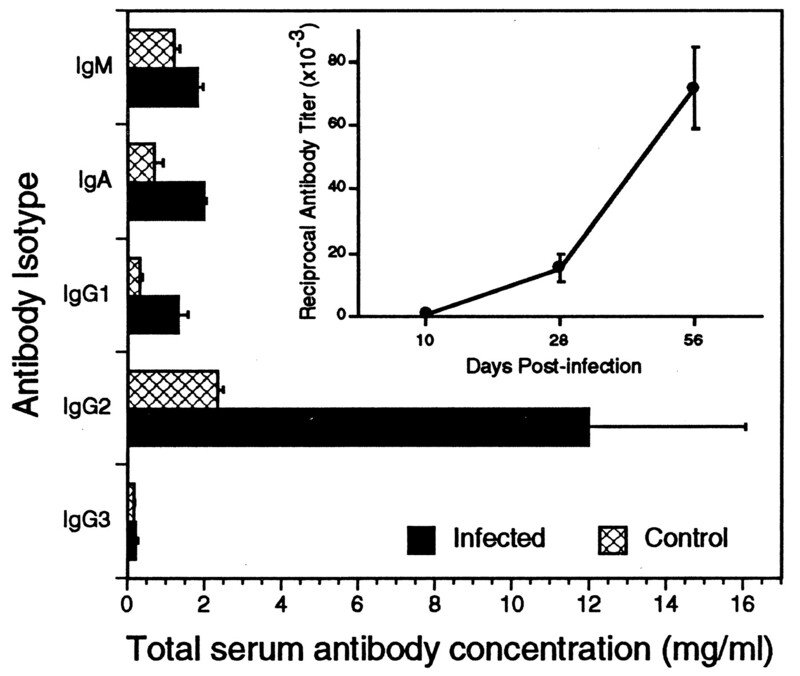 The serum concentration of IgG2 was increased almost 6-fold in the infected animals compared with uninfected controls. The levels of IgA and IgG1 increased 2- to 3-fold, whereas the IgM and IgG3 concentrations did not increase significantly. Ab response in hamsters infected with L. donovani. Total Igs were quantified in the serum of hamsters 56 days p.i. by radial immunodiffusion. Shown are the serum Ig concentrations in milligrams per milliliter (mean of three to four samples with SE bars). The Leishmania-specific total IgG response over the course of infection was quantified by ELISA and is shown as the reciprocal Ab titer (×10−3) in the inset. We analyzed the expression of cytokine mRNA in the spleen, liver, and bone marrow of control (uninfected) hamsters, and hamsters that were 3, 10, 28, and 56 days p.i. ( Figs. 3–5⇓⇓⇓). During this time period, the infected hamsters had a relentlessly increasing parasite burden and developed splenomegaly, anemia, and cachexia, all of which are reminiscent of active human disease. We reasoned that the immunopathogenic mechanisms related to progressive parasite replication would be evident during this time period. Splenic cytokine mRNA expression in control and L. donovani-infected hamsters. The spleens of uninfected controls and hamsters infected for 3, 10, 28, and 56 days were analyzed. Thirty micrograms of hamster spleen total RNA was separated by agarose gel electrophoresis and probed with the labeled HPRT, IL-2, IL-4, IFN-γ, TNF-α, IL-10, IL-12p40, and TGF-β cDNA probes. Hybridization with the HPRT cDNA was used to assess loading equivalency and RNA integrity. The data presented are from two blots. The top HPRT panel corresponds to the IFN-γ, IL-2, and IL-4; and the lower HPRT panel corresponds to the TNF-α, IL-10, IL-12, and TGF-β. Semiquantitative analysis of mRNA expression by densitometry is shown in the left panel. The autoradiographic bands shown in the right panel were quantified by video image analysis. Shown are the mean ± SEM of the ratio of the cytokine to HPRT band from the same sample. C-3 and C-56 are uninfected control hamsters that were age matched to the day 3- and day 56-infected animals. Hepatic cytokine mRNA expression in control and L. donovani-infected hamsters. The data was generated and is presented exactly as described for the splenic cytokine mRNA data in Fig. 3⇑. Cytokine mRNA expression in the bone marrow of control and L. donovani-infected hamsters. Bone marrow samples of uninfected controls and hamsters infected for 3, 10, 28, and 56 days were analyzed. Thirty micrograms of total RNA from hamster bone marrow was separated by agarose gel electrophoresis and probed with the labeled HPRT, IFN-γ, and IL-10 cDNA probes. In general, the expression of cytokine mRNA in response to visceral infection was less in the liver than the spleen when both were normalized to the level of HPRT expression (Figs. 3⇑ and 4⇑). With the exception of TGF-β (discussed below), the expression of the cytokines in the liver paralleled that of the spleen. Basal expression in uninfected animals was not detected or was detected at a minimal level for all of the cytokines except splenic TGF-β. There was prominent expression of mRNAs for the Th1 cytokines IFN-γ and IL-2 in the spleens, and to a lesser degree in the livers of infected animals (Figs. 3⇑ and 4⇑). In the spleen the quantity of these transcripts increased substantially as the disease progressed. IFN-γ mRNA was also prominently expressed in the bone marrow of day 10- and day 28-infected animals but not the uninfected controls (Fig. 5⇑). By day 56 p.i., at a time when the animals were experiencing substantial morbidity and the bone marrow had lost cellular mass, the level of IFN-γ mRNA in the bone marrow had decreased almost to baseline levels. The expression of these mRNAs was determined in whole tissue not isolated cells. This response must therefore be referred to as Th1-like because we have not confirmed that Th cells are the source of the IFN-γ. Transcripts for IL-12, a Th1-promoting cytokine, were modestly elevated in the spleens of infected hamsters starting as early as day 3 and peaking at day 28 p.i. (Fig. 3⇑). IL-12 mRNA expression in the liver tissue of infected hamsters was not significantly increased above the level in uninfected controls (Fig. 4⇑). The Th2 cytokine IL-4 was not detected in liver tissue of either uninfected or infected hamsters (Fig. 4⇑), but there was a very low level of basal expression in the spleen tissue (Fig. 3⇑). There was no increase in IL-4 mRNA expression in response to infection at any of the time points. TNF-α mRNA expression increased dramatically by 3 days p.i. and then just as quickly decreased to near baseline levels after day 10 p.i. (Figs. 3⇑ and 4⇑). Maximal production of TNF/LT protein by spleen cells cultured ex vivo was delayed considerably after the first appearance of the TNF-α mRNA. At days 3 and 10 p.i. (when TNF-α mRNA expression was maximal), there were increased but submaximal levels of TNF/LT in the splenic and liver homogenates, and the level of TNF/LT protein released by cultured spleen cells was equivalent to uninfected controls. However, by day 28 p.i., the TNF/LT protein production by spleen cells from infected animals was increased ∼50-fold over the uninfected controls (Fig. 6⇓). Because the TNF/LT was determined by bioassay (L929 cytotoxicity), and other cytokines (e.g., IL-6) could show cytotoxic activity, we used a neutralizing anti-TNF-α Ab (which is likely to also neutralize LT) to confirm the specificity of the assay. All of the cytotoxic activity was blocked by the Ab. Splenic and hepatic production of TNF/LT during the course of L. donovani infection. Left, Quantification of TNF/LT in liver and spleen tissue. Tissue was collected from uninfected controls and hamsters infected for 3, 10, 28, and 56 days, homogenized, and the soluble supernatant was tested for cytotoxic activity using the L929 cell line. Right, Ex vivo TNF/LT production by spleen cells. Spleen cells were obtained from control and infected hamsters and cultured ex vivo for 48 h, and the supernatants were analyzed for cytotoxic activity using the L929 cell line. The cytotoxic activity was blocked completely by neutralization with a TNF/LT-specific Ab. Transcripts for the macrophage deactivating cytokine IL-10 increased progressively throughout the course of infection in the liver, spleen, and bone marrow. There was strong correlation between IFN-γ and IL-10 mRNA expression (r = 0.91). Analysis of TGF-β mRNA revealed an unusual pattern of expression. Basal expression in the spleens of uninfected hamsters was very high, but was barely detectable in the liver of control animals. After infection there was a dramatic decrease in TGF-β mRNA in the spleen as early as 3 days p.i., but then it increased over time to slightly above baseline level by day 56 p.i. In the liver, there was a significant increase in TGF-β mRNA in response to infection. Analysis of TGF-β protein expression by immunoblotting indicated that there was detectable basal production of the active form of the molecule in the liver, spleen, and bone marrow and that late in the course of infection there was a dramatic increase in its synthesis (Fig. 7⇓ and data not shown). There was a striking reciprocal expression of TNF-α and TGF-β mRNAs in both organs, but as has been previously described (26, 27) the level of mRNA expression for both of these cytokines did not correlate with the level of protein production. In situ synthesis of active TGF-β in spleen and liver tissue of control and L. donovani-infected hamsters. The level of expression of the active form of TGF-β was determined by Western blotting. Equal amounts of homogenates (equivalent to 60 mg of tissue) from control and infected spleen and liver tissue were subjected to SDS-PAGE under nonreducing conditions, electroblotted onto nitrocellulose membranes, and TGF-β was detected with affinity-purified chicken anti-human TGF-β1 polyclonal Ab. The membranes were washed, and the bound Ab was detected with sheep anti-chicken Ig and autoradiography. Recombinant human TGF-β1 was used as a standard. The high level of IFN-γ mRNA expression in the face of progressive disease raised the possibility that there was a defect in macrophage effector function. Therefore, we examined the expression of NOS2, the primary mechanism of control of intracellular pathogens in mice and rats. Initially we performed Northern blots using the mouse NOS2 cDNA as a probe and found that in mice infected with L. donovani, in which the disease is self-limited, there was strong splenic NOS2 mRNA expression, but NOS2 mRNA expression could not be detected in the hamster (data not shown). The ability of the mouse cDNA probe to hybridize with the hamster gene was confirmed by Southern blot using mouse and hamster genomic DNA (data not shown). To confirm the absence of NOS2 expression in the hamster, we then cloned a 196-bp fragment of the hamster NOS2 cDNA and used it as a probe to detect NOS2 mRNA expression in infected hamster and mouse spleens. This fragment had 90% sequence identity with the corresponding mouse (exon 12) sequence (Fig. 8⇓A). Again, we found no NOS2 expression in hamsters, but did find strong expression in L. donovani-infected mice using the hamster probe (Fig. 8⇓B). We then confirmed that NOS2 protein expression was absent by measuring the enzyme activity in the infected tissue. Spleen tissue from infected BALB/c mice contained strong NOS2 enzymatic activity but spleen tissue from infected hamsters had no detectable NOS2 activity (Fig. 8⇓C). Thus we were unable to detect expression of NOS2 mRNA or active protein in liver or spleen tissue of hamsters at any time point during the course of progressive visceral infection. In contrast, there was prominent expression of iNOS mRNA and protein in the spleens of infected BALB/c mice that are able to control the infection. Analysis of splenic NOS2 mRNA expression and enzyme activity in infected hamsters and BALB/c mice. A, Sequence of the cloned hamster NOS2 probe used for determination of mRNA expression. The hamster (H) sequence is shown aligned with the corresponding mouse (M) and rat (R) sequences. Mouse and rat nucleotides that are identical with the hamster nucleotide are designated with a dot. B, Splenic NOS2 mRNA expression in response to L. donovani infection. The spleens of hamsters infected for 3, 10, 28, and 56 days and BALB/c mice infected for 28 and 56 days, and their respective uninfected controls, were analyzed. Thirty micrograms of total splenic RNA was separated by agarose gel electrophoresis and probed with the labeled HPRT and hamster NOS2 cDNA probes. Shown is an autoradiogram after exposure for 3 days; there was also no detectable hamster NOS2 mRNA even after exposure of the autoradiogram for >8 days. C, NOS enzyme activity in infected and uninfected mouse and hamster spleen tissue. Inducible NOS (Ca2+-independent NOS2) and cNOS (Ca2+-dependent NOS) enzymatic activities were determined by the extent of conversion of l-[3H]arginine to l-[3H]citrulline in the presence (NOS2) or absence (cNOS) of Ca2+ chelators using the NOSdetect assay kit (Stratagene). The NOS2 enzyme activity was determined in the supernatant of homogenized spleen tissue and is expressed in nmol/min/gram of tissue. cNOS enzyme activity was measured in the same way as NOS2 except that the homogenizing buffer and the reaction mixture contained no EGTA or EDTA, but did contain 1 mM N-monomethyl-l-arginine (a NOS2-specific inhibitor). The hamster model of VL closely mimics the features of active human disease. Following systemic infection with L. donovani, these animals develop a progressively increasing visceral parasite burden, massive splenomegaly, bone marrow dysfunction, cachexia, and ultimately death. We show here that progressive disease in this model of VL occurs in the presence of strong Th1-like cytokine (IFN-γ and IL-2) mRNA expression. We did not identify a source of these cytokines so cannot definitively conclude that they are products of Th cells. The hamster IFN-γ response is similar to what has been demonstrated in active human VL (28, 29) and is concordant with the previous work of Gifawesen and Farrell, who demonstrated that T cells from infected hamsters could transfer parasite-specific delayed-type hyperresponsiveness to naive animals (9). The hamster’s susceptibility does not appear to be due to a delay in this Th1-like response, because splenic IL-12 expression was detected as early as 3 days p.i. To support the functional significance of the Th1 response, we measured the total serum Ig isotypes in infected animals. Although there is no data concerning the regulation of isotype switching in the hamster, if it is analogous to the mouse, then our finding of a dramatically increased total IgG2 isotype would suggest a dominant Th1-like cytokine effect. Despite the prominent IFN-γ expression in the visceral organs, parasite replication was unrestrained and there was an absence of NOS2 mRNA expression and enzyme activity. The IFN-γ-inducible NOS2 enzyme, which is strictly transcriptionally regulated, generates reactive nitrogen intermediates (most notably NO). The importance of the generation of NO as a macrophage antimicrobial effector mechanism in the murine model of leishmaniasis is underscored by the following observations: 1) the killing of parasites by IFN-γ-activated macrophages in vitro is dependent on the expression of NOS2 and generation of NO (30, 31), 2) inbred mouse strains that show in vivo resistance to leishmanial infection demonstrate a high level of NOS2 expression and NO generation (8, 32), and these mice are rendered susceptible when NOS2 is inhibited (32), 3) highly susceptible inbred mouse strains respond to leishmanial infection with a low level of NOS2 expression (8, 32), and 4) mice carrying a null deletion of the NOS2 gene are highly susceptible to both Leishmania major and L. donovani infection (33, 34). Expression of NOS2 mRNA could not be detected in the hamster liver or spleen in response to L. donovani infection, using either a mouse or hamster cDNA probe. In contrast, tissue expression of abundant NOS2 transcripts was associated with self-controlled L. donovani infection in the mouse. These findings were confirmed at the protein level by detection of NOS2 enzymatic activity in mouse but not hamster spleen tissue. The impairment of this critical antileishmanial effector mechanism may explain the hamster’s inability to control infection with L. donovani and other intracellular pathogens to which it is highly susceptible. The lack of expression of NOS2 mRNA was not due to an absence of the gene, although the possibility of a pseudogene cannot be excluded. We detected hamster NOS2 DNA by Southern blot hybridization with a mouse cDNA probe and isolated two distinct fragments of the hamster NOS2 genomic DNA: a ∼200-nt piece (used as the probe for the Northern blots in this study) corresponding to exon 12 of the human homologue and a 200-nt piece corresponding to exon 1 and the 5′ flanking region (P. C. Melby, unpublished observations). These fragments showed 80–90% sequence homology with the mouse homologue. The impaired NOS2 expression was also not related to a dominant IL-4-driven Th2 phenotype as is observed in mice highly susceptible to L. major. (35). In hamsters infected with L. donovani, we found no increase in the splenic or hepatic IL-4 expression over the basal level. However, there was prominent expression of IL-10 and TGF-β, cytokines known to suppress macrophage activation and NOS2 expression (12, 13, 36). The high level of IL-10 expression in the liver, spleen, and bone marrow later in the course of infection in this model is similar to the expression of IL-10 mRNA observed in the spleen and bone marrow of patients with active VL (28, 29). In these human studies, the prominent coexpression of IFN-γ mRNA led the investigators to postulate that during active disease IFN-γ-mediated macrophage activation is blocked by IL-10. The significance of IL-10 in the pathogenesis of human VL is further supported by the observation that parasite-specific T cell responses were down-regulated by IL-10 (37, 38), and NO-mediated killing of Leishmania infantum by human macrophages was inhibited by IL-10 (39). In our study, the expression of IFN-γ (especially in spleen and bone marrow) was relatively unopposed by IL-10 until later in the course of infection. This would argue against a prominent macrophage-deactivating role of IL-10 in the hamster, at least early (3 days p.i.) in the course of infection. Once reagents for neutralization of hamster IL-10 become available, we will be able to better define the in vivo role of IL-10 in the pathogenesis of VL. The production of the active form of TGF-β was also found to increase during the course of progressive disease. This may also contribute to the impaired NOS2 expression and the inability to control the infection. In a previous study, murine macrophages infected in vitro with L. major produced TGF-β in a quantity sufficient to suppress macrophage activation, and when the infected macrophages were pretreated with TGF-β, IFN-γ-mediated killing of intracellular parasites by NO was blocked (40). In vivo neutralization of TGF-β at the site of cutaneous L. major infection enhanced NO production and promoted healing in mice (41). Recently, Rodrigues et al. demonstrated that TGF-β production by splenic adherent cells from hamsters with active VL suppressed the lymphoproliferative response of spleen cells to Leishmania Ags (42). As was the case for IL-10, the increased production of TGF-β did not occur until late in the course of infection, suggesting that parasite-induced TGF-β is not the primary reason for the early absence of NOS2 expression. However, it is possible that the basal expression of active TGF-β protein observed in the liver and spleen could inhibit macrophage NOS2 expression (possibly through an autocrine effect) and promote susceptibility to infection. NOS2 expression was absent despite the strong expression of TNF/LT, a second signal that is known to act synergistically with IFN-γ in the induction of NOS2 (43). In the murine models of cutaneous and visceral leishmanasis, the production of TNF-α at the site of infection has been demonstrated to have a protective effect (44, 45). Conversely in the hamster, the increased production of TNF-α, a known inducer of cachexia (46), probably contributed to the profound weight loss and muscle wasting observed late in the course of infection. Pearson and colleagues demonstrated previously that macrophages from L. donovani-infected hamsters produced high levels of cytokines that were cytotoxic for the L929 cell line (presumed to be TNF-α) (10). Our study confirmed the production of a high level of TNF/LT late in the course of infection when the animals began to lose weight. Alternatively, the hamster may not be able to control the L. donovani infection because of a fundamental defect in the capacity of macrophages from these animals to generate NO in response to IFN-γ. In fact, the importance of NO as an antimicrobial effector mechanism of macrophages has been clearly defined only in mice and rats (47, 48). The role of NO synthesis in antimicrobial activity of human macrophages is controversial. Human macrophages have impaired IFN-γ-induced NO production when compared with mouse macrophages (49), although NOS2 expression has been demonstrated in human inflammatory lesions (50, 51, 52). Macrophages from rabbits and guinea pigs, which are highly susceptible to infection with Mycobacterium tuberculosis, also do not produce NO under conditions that induce NO synthesis in mouse or rat macrophages (49, 53). Hamster macrophages may be similarly hyporesponsive to IFN-γ. The impaired IFN-γ-mediated induction of NOS2 in human macrophages is thought to be related to nucleotide sequence differences in critical transcription factor binding sites in the human compared with mouse NOS2 promoter (54). We have recently cloned the hamster NOS2 promoter region, and studies are underway to determine whether impaired IFN-γ-induced macrophage NO synthesis in the hamster is related to sequence differences in the promoter. In summary, this study demonstrates that the clinicopathologic features and immunopathologic mechanisms of VL in the hamster model are remarkably similar to the human disease, but strikingly different from the commonly used murine model. Despite strong expression of Th1-like cytokines in the liver, spleen, and bone marrow, there is impaired macrophage activation and an inability to control parasite replication. 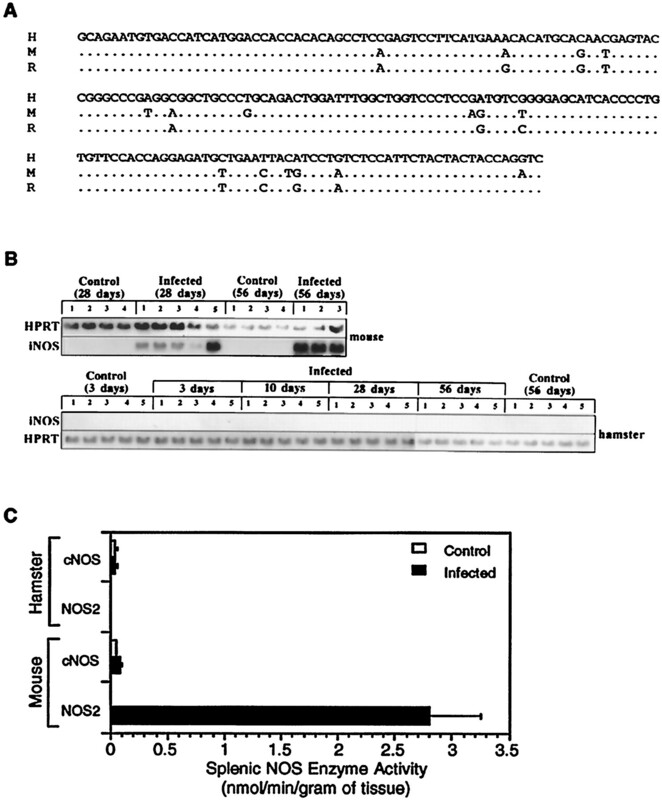 The induction of NOS2 activity, the critical antileishmanial effector mechanism in mice, was absent throughout the course of infection in the hamster. Further studies to define the regulation of NOS2 and the role of other antimicrobial mechanisms in this animal model are warranted. We thank Drs. Linda Bonewald and Sunil Ahuja for their helpful discussion related to these studies and Barry Grubbs for providing the L929 cell line and TNF-α assay protocol. ↵1 This work was supported in part by the U.S. Agency for International Development Middle East Regional Cooperation Program and in part by a Merit Review Grant from the U.S. Veterans Administration. Partial salary support for P.C.M. was provided by the Kleberg Foundation. ↵3 Abbreviations used in this paper: VL, visceral leishmaniasis; iNOS, NOS2, inducible NO synthase; HPRT, hypoxanthine phosphoribosyltransferase; HIFCS, heat-inactivated FCS; p.i., postinfection; LT, lymphotoxin; cNOS, Ca2+-dependent NOS. Sacks, D., and P. Melby. 1998. Animal models for the analysis of immune responses to leishmaniasis. In Current Protocols in Immunology. J. Coligan, A. Kruisbeek, D. Margulies, E. Shevach, and W. Strober, eds. John Wiley and Sons, Inc., p. 19.2.1.